An elegant table arrangement for the grandest moment of one's life. Suitable for dining tables, reception or cocktail areas. 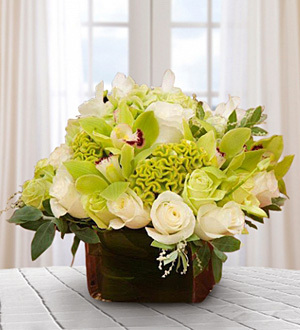 Cream Roses 20 stalks, Celosia Cristata 5 stalks, Green Cymbidium 1 stalk, Green Eustoma and matching foliage. You may choose to change the colors of the flowers to suit your theme and preference. Availability of colors and special seasonal flowers are subject to changes. Contact our floral advisers at sales@gift-lab.com or +603-78830233 for further clarification.